Steel: The EnviroMetal: Wash Cycle, Rinse Cycle, Spin Cycle - Recycle! Wash Cycle, Rinse Cycle, Spin Cycle - Recycle! We’re nation dependent upon appliances. Our water heaters, ovens, refrigerators, air conditioners, washing machines and other white goods quietly fulfill essential roles in our daily lives. In the United States, 98 percent of homes have a refrigerator. An estimated 98 percent have a range. Appliances are designed to save energy and labor, giving us time to do other things. Normally, these faithful servants will chill, cook, or clean for us for fifteen or more years. But at some point in their lives, appliances must be replaced. An estimated 54 million appliances are disposed of each year in the United States. All major appliances are made predominantly of steel. The majority of this steel is found in the metal shell or body that encases an appliance’s electrical components. While steel is used in appliances for its strength, economy and durability, it also makes appliances recyclable. 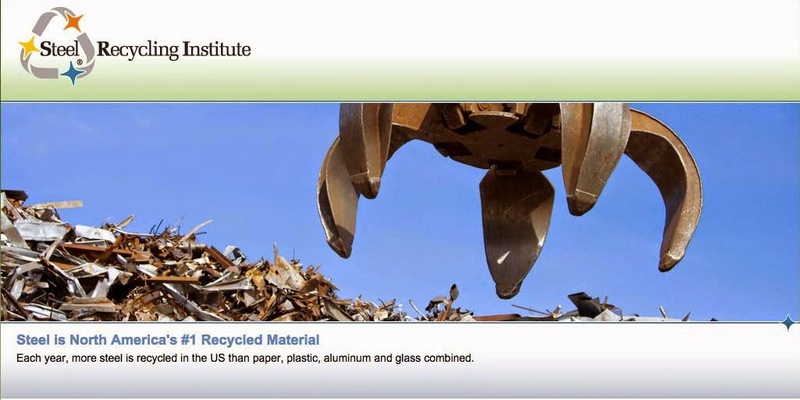 Steel is the heavy-weight champion of the recycling world. More steel is recycled in all of North America than any other material. In 1995, about 70 million tons of steel scrap were recycled, including scrap from post consumer steel products such as appliances. The reason why so much steel is recycled is that steel mills need steel scrap to make new steel. The two types of steelmaking processes used in the United States to make new steel, the basic oxygen furnace (BOF) and the electric arc furnace (EAF), use steel scrap to make new steel. The BOF consumes about 28 percent steel scrap to produce new steel. The EAF melts virtually 100 percent steel scrap to make new steel. More than 68 percent of the 103 million tons of new steel that poured from steelmaking furnaces in 1995 was obtained from melted scrap. By weight, the average appliance consists of about 75 percent steel, which makes it an excellent feedstock of steel scrap for recycling into new steel. Between 1990 and 1995, the national recycling rate for home appliances rose from 32 percent to 74.8 percent. More than 2.1 million tons of steel recovered from appliances were recycled in 1995. How can you recycle an appliance like your refrigerator or clothes washing machine? Actually, there are a variety of ways in which your old appliances can enter the recycling infrastructure. Call your local recycling or solid waste management office to determine if you live in one of the many communities that offers municipal pick-up of appliances. Most communities also allow residents to take their appliances to designated drop-off sites. If your community doesn’t offer appliance recycling, there are still options. If you’re purchasing a new appliance, many retail establishments will accept your old one when they deliver the new one. To help residents reduce their monthly electric bills and total load on the power plant, utility companies occasionally work with communities to sponsor appliance “take back” programs for working appliances that are actually unneeded, such as the extra refrigerator in the garage or basement. And although they normally deal with bulk quantities, ferrous scrap yards will probably accept your appliance for recycling. Of course, there’s another easy way to determine where you can recycle your appliance. Call the SRI’s toll-free consumer information line, 1-800-YES-1-CAN (937-1226). By calling the number, consumers can locate the closest option, by zip code, that accepts appliances for recycling or order information about appliance recycling. What happens to your old appliance once it is collected for recycling? First, appliance processors normally remove components, such as electric motors, capacitors, switches and other mechanical parts, from the appliance. If the appliance is a refrigerator, freezer or some other type of appliance with cooling equipment, then its refrigerant gases must be captured and recycled. See the sidebar on the next page for more information about special processing considerations. At a ferrous scrap processing yard, the appliance shell is then typically hoisted onto a conveyor belt, which feeds it to a massive automobile shredder. Its whirling hammers crush and shred the appliance into fist-sized chunks which exit the shredder onto a conveyor belt. The steel pieces are then magnetically separated from the other metals and plastics and shipped to steel mills for recycling into new steel. Nonferrous metals, such as copper and aluminum, are usually removed and recycled as well. As about 75 percent of the average appliance is made from steel, the remaining material, such as plastic and rubber, is usually accumulated for disposal at a landfill. Appliances are not just recyclable, they’re also made from recycled steel. The steel used to make new appliances is made from about 28 percent recycled steel. Appliance recycling conserves energy, landfill space and natural resources. By recycling the extra refrigerator in the basement, residents save on their electric bill. Recycling bulky appliances leaves room for other solid waste to be landfilled. Of course, the steel industry benefits from recycling steel appliances as well. The 2.1 million tons of steel recovered from recycled appliances conserved more than 2 million tons of iron ore, nearly 1.5 million tons of coal, and 126,000 tons of limestone. Some appliances have special processing considerations before a ferrous scrap processor can accept the appliance for recycling. Refrigerators, freezers and other appliances designed to cool contain refrigerant gasses like CFCs or HCFCs. By law, these refrigerant gases must be recovered before an appliance can be recycled. Some communities, therefore, charge residents a fee, usually between $10 and $20, to accept these types of appliances to cover the labor and equipment for these additional processing costs. Not all communities do so: on page 9, we profile how Pima County, AZ negotiated a contract with a local ferrous scrap processor to reduce these costs for their residents. Legislation enacted more than 20 years ago has significantly altered the way appliances are processed for recycling today. Originally passed in 1970, the Clean Air Act was America’s first comprehensive legislation to cover emission of pollutants to the air. The act was later updated to reflect the goals of the 1987 Montreal Protocol on Substances that Deplete the Ozone Layer. This international agreement was signed by more than 100 nations and requires each country to cut its production of ozone depleting substances in half by 1998. Later, the Protocol was amended to include the complete phase-out of the production of chlorofluorocarbons (CFCs) by the year 1995. As a result, the United States Environmental Protection Agency (EPA) has mandated that, prior to recycling or disposal, any refrigerant gases that are deemed as ozone depleting and found in appliances must be captured for recycling. CFCs and hydrochlorofluorocarbons (HCFCs), both considered ozone depleting coolants, are only found in appliances that refrigerate or cool. The CFCs and HCFCs that are reclaimed are cleaned and reused in the maintenance and repair of other units. In some areas, scrap dealers have the CFC removal equipment and certified technicians to easily accomplish these procedures. In other areas, specialty recycling companies provide this service, either independently or in association with appliance dealers or the local government. In either case, processors who are involved in the recycling of appliances are responsible for ensuring that the refrigerant gases have been reclaimed. Appliances often contain capacitors, which are electronic circuit devices for temporary storage of electrical energy. Polychlorinated biphenyls (PCBs), a carcinogen, are oily fluids used as electrolytic substances in a small percentage of capacitors produced prior to the year 1979. PCBs were used in some capacitors for air conditioners and microwave ovens and, much less often, for refrigerators and freezers. The Toxic Substances Control Act of 1968 banned the production and sale of PCBs after 1978, but allowed small capacitors used in household appliances to remain in service. Since the average life span of an appliance is 15 years, less than five percent of all appliances processed for recycling in 1988 contained PCB capacitors, according to the EPA. That small percentage is in all likelihood much smaller or virtually nonexistent today as many of these appliances have been recycled or disposed of.